The middle of the Mediterranean, in the far south-west of Sicily landmark inland belicino, Selinunte is certainly one of the most coveted for visitors and tourists who want to enjoy the beauty of art-historical, natural and gastronomic Sicily . One of its major attractions is the seaside activities and related viable in its various beaches, and unspoiled natural Mediterranean Sea of Selinunte and Triscina. The Lido Beach Pineda. Surely one of the most beautiful beaches and clean all Valle del Belice. Post pointed to the far west of Selinunte, at the end of the road Punta Canton, begins a staircase which leads in this superb beach. Right now, projecting our gaze down the hill towards, see the beautiful natural landscape that makes the Pineda a unique and fascinating place. A clear and unspoiled coastline, made up of golden sand that slopes gently down to a limpid sea, which extends for more than 5Km from Selinunte until Portopalo, all within the Nature Reserve of Belice with its wildlife and natural wonders. Down the stairs you find the Lido Restaurant Pineda Angelo where you can enjoy all the comforts and services bathing, as well as the possibility to eat directly on the seashore all the delicious fruits of the Mediterranean Sea Selinuntino. 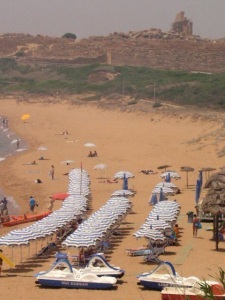 Lido Beach Zabbara Acropolis. Another magnificent beach is that of Lido Zabbara , which is also clean and unique placed at opposite points of Selinunte compared to Pineda is the only beach where you can swim and enjoy the hill above the 'Acropolis with all the splendour of its ancient temples. Panorama unique and unparalleled at sunset view of Acropolis from the beach or the sea, gives visitors a sense of peace and fascinating mystery; wonderful to photograph or simply admired for. Even Acropolis, the beach is equipped The Zabbara by Jojò, complete with deckchairs and umbrellas, paddleboats and canoes, and showers service restaurant with a stop for fresh all day on the beach to enjoy the sea and the sun of Sicily. Curiosity : walking along the beach, up to under the Acropolis, you can see bagnoasciuga immersed in the ancient slabs that formed the glorious < b>ancient port of Selinunte, unfortunately now submerged. Beach Port Scalo of Bruca. A beach very popular for its location in the centre of the square of Selinunte Scalo of Bruca (said at Scaro ) is that the two ports near the city center. Easy to reach, hectic life and movement, just behind various activities: bars, supermarkets, bazaars, shops, clubs water and more. 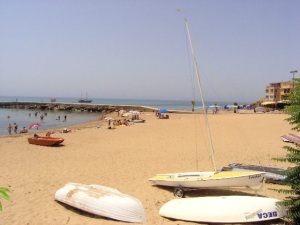 The beach divided into two by the port is a place of different activities, in the left side playful and sports, such as beach volleyball tournaments and football on the beach, sea and games of racing sailboat; The right side much more calm and accompanied by all bathing and gastronomic services offered by Lido Tuxè is suitable for families with their children want to spend a pleasant time at sea. Beach Triscina. 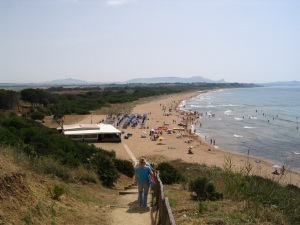 Finally, we can not fail to mention the wonderful beaches of nearby Triscina of Selinunte.The best bathing area, equipped with numerous tourist-commercial activities, in the west of Archaeological Park. 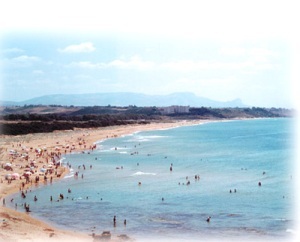 Triscina is famous for his long, broad and unspoiled coastline, sand dunes and scrub typical Mediterranean. 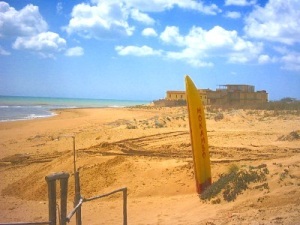 immense beaches and offshore, and uncontaminated make Triscina ideal for those who want to live the sea in a sport, many beaches equipped to carry out Win Surf, Surf casting, water skiing, canoeing and water scooter motorcycle.